Ever wonder what "Interactive Messaging" is? Well, it can mean a lot of different things depending on the context. This post focuses on Interactive Messaging in the context of digital out-of-home or digital signage, using the work Unwired Appeal did for Sprint's latest advertising campaign as an example. In Times Square there are more pedestrians than cars, and although the city is taking measures to make life easier for walkers, it sometimes takes skill and dexterity just to cross the street. 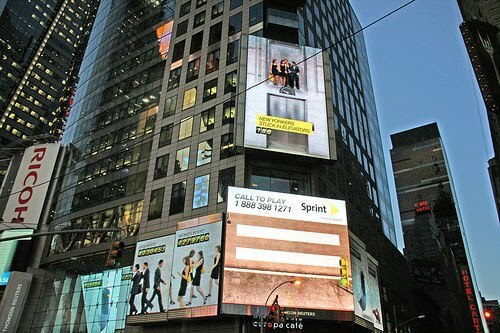 Sprint capitalized on this trend by creating an interactive game on the Reuters Billboard in Times Square. The game was a two player throwback to Frogger. Participants used their mobile phone to control the character on the billboard as he tried to cross the crosswalk. Two players played at a time, and the first to cross to the other sidewalk won. The joystick was used to move the character left and right in order to avoid oncoming walkers. After the game, participants were sent a text message thanking them as follows: "Thanks for taking on the streets of NYC with Sprint. The Now Network. To see more Now, go to http://sprint.com/nownetwork"
3) A means to follow up: Sending a text message to game participants means more hits to the "Now Network website". Thousands of visitors and tourists watched as Sprint showcased one of the more technologically advanced advertising campaigns in New York. Every slot purchased by Sprint was filled to max capacity by players. A total of 595 people signed up to play the game. The Debate: Are Shared Short Codes Safe?